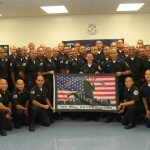 9-11 Patch Project National Tour Off the Hook!! 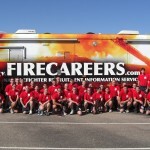 Manhattan to Manhattan 9-11 Patch Project/FireCareersBus Tour, the journey is off the hook. 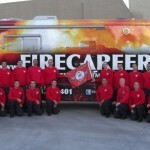 Since our send off party we have toured most of Arizona and Southern Nevada. We circled back to San Diego Ca. for Firehouse World and got in touch with the Terry Farrell Firefighter Fund We’ve met some amazing people, firefighters and future firefighters. We have been invited guests everywhere we go. I am so thankful to all the people we have met so far. GOT BUS? 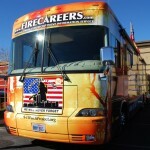 Get on the 9-11 Patch Project Manhattan to Manhattan Tour BUS. 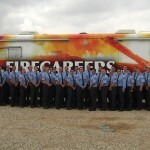 Get your name, church, military unit, firefighter local, police officer local, business, or organization included in the FireCareersBus SAFETY STRIP of names. That’s right we are starting to install our reflective strip around the BUS. Our strip will be multiple lines of inch and half reflective letters with names of those who donate $911.11 to the 9-11 Patch Project. Please show your support for some super programs make your donation today. Get on the BUS as soon as possible and show others your support and help us with our safety strip. Firefighter Academies who would like to be included in our album send me an email with a contact and we will do everything we can to make it happen. Dates in Bold have been confirmed.